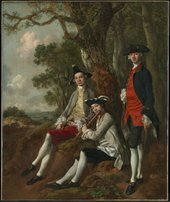 John Chu’s In Focus project offers a multi-disciplinary discussion of Thomas Gainsborough’s early triple portrait Peter Darnell Muilman, Charles Crokatt and William Keable in a Landscape c.1750. Here he discusses the possibilities opened up by digital publishing, the enormous breadth of expertise brought to this piece of research and his delight at learning of the eighteenth-century fashion for concealing flutes in walking sticks. Why did you choose Gainsborough’s Peter Darnell Muilman, Charles Crokatt and William Keable in a Landscape as the subject of your In Focus? I was thinking of works associated with my area of research, which is eighteenth-century Britain, and of works that would fit the In Focus format. Each In Focus is interdisciplinary and made up of a series of short essays from different perspectives; that narrows down the kind of works that would be interesting to explore in that way. This is a small conversation piece with various sitters, a landscape, and the elements of music and fashion – there’s a lot happening in the painting. My first instinct was to collaborate with a musician or a music historian, because the digital format opened up the possibility of an embedded recording which is a good way to broaden the audience for an artwork, so this painting was ideal in that respect. I’m also bringing to this an interest in pastiche in the eighteenth century, and how artists would imitate other artists, perhaps from the past. Early Gainsborough is a really interesting example of that. It’s often understood as being Gainsborough imitating others in order to supply a market for seventeenth-century Dutch pictures but there’s a lot more to think about with regard to this significant element of his oeuvre. The presence of portrait sitters within a Dutch-style landscape allowed me to set the taste for this kind of artistic imitation in a very specific milieu of overseas traders. It gives the aesthetic category of pastiche a social purpose, if you like. With an artist like Gainsborough you’re bringing a certain amount of background knowledge and understanding to it; for my PhD I worked on his late genre studies, for example, so I’d read the relevant literature and some of the primary sources as well. This painting has been written about so often as just ‘an early Gainsborough’ but I wanted to move away from that standard account. It was interesting to go to the archive and see the way that Tate has thought about the painting historically, in part through the records of its collaborative acquisition together with Gainsborough’s House. It’s much more interesting, to me, to see a painting like this in its context, not just the context of a ‘genius’, but the social, economic and cultural milieu of the time it was made. Due to its joint acquisition by Tate and Gainsborough’s House, both institutions have acquisition documents so it was interesting to compare them. It was also interesting to see the different collecting strategies of the two institutions: at Tate the painting takes its place among great artworks of the eighteenth century, whereas at Gainsborough’s House they’ve collected around the work, for example book illustrations, material from the local records office, prints of the houses the sitters lived in, and so on, and some of that richness is illustrated in the In Focus. How did you commission the other contributors? Peter Moore was Research Curator at Gainsborough’s House at the time and his PhD was on art and the transatlantic world in the eighteenth century; we knew that one of the sitters in the painting was a Carolina trader so his expertise was perfectly suited to the project and to my ambition to bring the wider cultural and economic context to the fore. I came across Hannah French through the Royal Academy of Music when looking for an early Baroque flute specialist, specifically someone who is a practitioner as well as an academic. Serendipitously, her PhD was on the reception of Baroque music in the twentieth century, but in the early stages, prior to a change in focus, she’d begun researching the dissemination of flute playing in the early eighteenth century, so she had a foundation of archival research already. Huw David had written his PhD on James Crokatt, the father of Charles Crokatt who is depicted in the painting, so he had a huge bank of information about South Carolina trading and that family’s history. There had been a degree of sampling done to the painting but it had never been x-rayed or examined with infrared and I knew from the start that I wanted to have the painting technically analysed, which led to working with Tate conservators Rebecca Hellen and Alexandra Gent. One of the characteristic things about eighteenth-century conversation pieces is that they changed a lot in the process of making so I suspected there’d be some good findings. In part, I think that’s because the format is less standardised compared to something like a head-and-shoulders portrait, so often artists were figuring out how to make a more complex composition work. With multiple sitters there were multiple clients to please, so this may also have contributed to the numerous adjustments. Seeing how much the picture changed over time was a revelation, as was the actual process of examining the painting through the microscope which I was lucky enough to do alongside Rebecca and Alexandra. Were there any surprises in the process of researching the painting? I think one of my favourite discoveries was when Hannah and I were remarking on the similarity in the picture between the walking canes and the flute. It’s the kind of thing you often only notice through prolonged careful looking in front of a work of art, which is what we were doing at the time. Hannah observed that, of course, flutes and other musical instruments were often hidden in walking sticks in the period. This was such a lovely revelation. We realised then and there that the survival of so many of these flute-walking sticks meant that the kind of musical walking party that Gainsborough depicts must have been a reality, not just a pictorial fancy, and that his picture captured the close relationship between the two recreations in a kind of visual rhyme. It was all the more satisfying for being a revelation that came about in a discussion between people from different but complementary disciplines. What do you think are the advantages of this kind of multidisciplinary approach to art historical research? I think it brings an enormous depth of knowledge, and then the specificity of the project means that knowledge has to be acutely focused on this single work of art. Commissioning and editing work from a variety of specialists allowed me to see my own discipline – the social history of art – through fresh eyes. It’s easy to forget just what a tall order it is to marry contextual evidence to close visual analysis without a lot of training and practice. Having said that, many researchers working in the humanities are familiar with a range of approaches, for example historians often use visual sources as well as textual sources, musicologists are usually interested in the cultural politics of the time as well as the technicalities of musicianship, and so on. One fascinating example of the value of working collaboratively with researchers from other disciplines was when Hannah French was able to judge the precision of Gainsborough’s representation of the flautist’s playing position, not by simply referring to eighteenth-century manuals on how to position the body and hold the flute, but by actually playing a reproduction Baroque flute and having a physical understanding of the instrument. That’s something an art historian could seldom offer and never to same degree. How does your research inform the way the work is viewed today? When at Tate Britain, this small painting sits in these grand hall-like galleries with lots of other works of art, but that isn’t where pictures such as this were intended to be seen at all. They were made for intimate, domestic settings, and were part of the fabric of everyday life – albeit with a very special role to play. This research goes some way to returning the painting to that situation, restaging it in the minds of the reader in another time and place. In this project, of course, the reader is also a listener, and we’re incredibly lucky to have got Hannah’s historically-informed musicianship on record, immersing us in the sound world of the picture. My hope is that this research will allow us to move away from that standard narrative I described, of seeing this painting solely as an unusually fine example of Gainsborough’s early work, and instead allow it to take part in a broader and more widely ranging conversation about eighteenth-century art and society. Perhaps it will also inform our understanding of other paintings produced by Gainsborough at the same moment, and to consider them not only as a family of paintings but also as a series of distinct interactions with a multifaceted, far-distant world; yet one with deep connections to our own. Dr John Chu is Assistant Curator – Pictures and Sculpture, National Trust. ‘Muilman, Crokatt and Keable in a Landscape: Interview with John Chu’, Tate Research Feature, March 2017, https://www.tate.org.uk/research/features/interview-john-chu, accessed 22 April 2019.